A potassium-ion battery or K-ion battery (abbreviated as KIB) is a type of battery and analogue to lithium-ion batteries, using potassium ions for charge transfer instead of lithium ions. It was invented by the Iranian/American chemist Ali Eftekhari (President of the American Nano Society) in 2004. 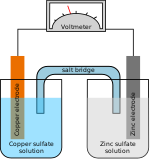 The prototype device used a potassium compound Prussian blue as the cathode material for its high electrochemical stability. The prototype was successfully used for more than 500 cycles. A recent review showed currently that several pragmatic materials have been successfully used as the anode and cathode for the new generations of potassium-ion batteries.For example, the conventional anode material graphite has been shown that it can be used as anode in potassium-ion battery. , the cell potential is similar to that of lithium-ion. Potassium batteries can accept a wide range of cathode materials which can offer rechargeability lower cost. One noticeable advantage is the availability of potassium graphite, which is used as an anode material in some lithium-ion batteries. Its stable structure guarantees a reversible intercalation/de-intercalation of potassium ions under charge/discharge. 6 was patented. In 2007, Chinese company Starsway Electronics marketed the first potassium battery-powered portable media player as a high-energy device. Potassium batteries have been proposed for large-scale energy storage given its exceptional cycleability. The interesting and unique feature of potassium-ion battery in comparison with other types of batteries is that the life on the planet is somehow based on biological potassium-ion batteries. K+ is the key charge carrier in plants. Circulation of K+ ions facilitates the energy storage in plants by forming decentralized potassium batteries. This is not only an iconic feature of potassium-ion batteries but also indicates how important it is to understand the role of K+ charge carriers to understand the living mechanism of plants. Researchers demonstrated a potassium-air battery (K−O2) with low overpotential. Its charge/discharge potential gap of about 50 mV is the lowest reported value in metal−air batteries. This provide round-trip energy efficiency of >95%. In comparison, lithium–air batteries (Li-O2) have a much higher overpotential of 1–1.5 V, which results in 60% round-trip efficiency. ^ a b Eftekhari, A (2004). "Potassium secondary cell based on Prussian blue cathode". Journal of Power Sources. 126 (1): 221–228. Bibcode:2004JPS...126..221E. doi:10.1016/j.jpowsour.2003.08.007. ^ Itaya, K; Ataka, T; Toshima, S (1982). "Spectroelectrochemistry and electrochemical preparation method of Prussian Blue modified electrodes". Journal of the American Chemical Society. 104 (18): 4767. doi:10.1021/ja00382a006. ^ Eftekhari, A; Jian, Z; Ji, X (2017). "Potassium Secondary Batteries". ACS Applied Materials & Interfaces. 9 (5): 4404. doi:10.1021/acsami.6b07989. ^ Luo, W; Wan, J; Ozdemir, B (2015). "Potassium Ion Batteries with Graphitic Materials". Nano Letters. 15 (11): 7671–7. doi:10.1021/acs.nanolett.5b03667. PMID 26509225. ^ "New battery concept: potassium instead of lithium". 8 October 2015. ^ "High-Capacity Aqueous Potassium-Ion Batteries for Large-Scale Energy Storage". 2 December 2016. ^ "Potassium Ions Charge Li Batteries Faster". 20 January 2017. ^ "Researchers reveal 'supercharger' battery breakthrough that could lead to phones that charge in minutes". 18 January 2017. ^ Yamamoto, Takayuki; Matsumoto, Kazuhiko; Hagiwara, Rika; Nohira, Toshiyuki (7 August 2017). "Physicochemical and Electrochemical Properties of K[N(SO2F)2]–[N-Methyl-N-propylpyrrolidinium][N(SO2F)2] Ionic Liquids for Potassium-Ion Batteries". The Journal of Physical Chemistry C. 121 (34): 18450–18458. doi:10.1021/acs.jpcc.7b06523. ^ "Rechargeable potassium-ion batteries with honeycomb-layered tellurates as high voltage cathodes and fast potassium-ion conductors". 20 September 2018. ^ Melanson, D (24 October 2007). "China's Starsway touts potassium battery-powered PMP". Engadget. Retrieved 2011-09-16. ^ "New Battery Technology Could Provide Large-Scale Energy Storage for the Grid". 25 November 2011. ^ "Battery electrode's 40,000 charge cycles look promising for grid storage". 22 November 2011. ^ Gajdanowicz, Pawel (2010). "Potassium (K+) gradients serve as a mobile energy source in plant vascular tissues". Proceedings of the National Academy of Sciences of the United States of America. 108 (2): 864–869. Bibcode:2011PNAS..108..864G. doi:10.1073/pnas.1009777108. PMC 3021027. PMID 21187374. ^ Ren, Xiaodi; Wu, Yiying (2013). "A Low-Overpotential Potassium−Oxygen Battery Based on Potassium Superoxide". Journal of the American Chemical Society. 135 (8): 2923–2926. doi:10.1021/ja312059q. PMID 23402300. This page was last edited on 8 March 2019, at 11:59 (UTC).